One of my favorite thrifty finds last year. I don't know why it's taken me so long to share it. I've always been drawn to vintage hammered aluminum pieces, but I never appreciated their beauty or origins till I met Susan. She has the most mind blowing collection I've ever seen and she is very knowledgeable about her passion. We have the most incredible Goodwill store here in town and last fall I found this tray. So clean and organized and I find good stuff there all the time. 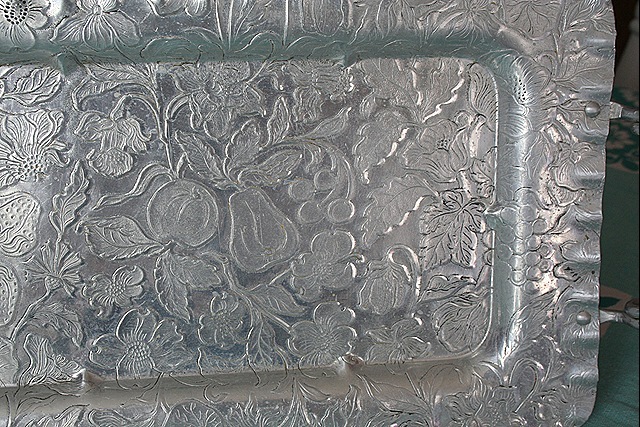 This tray is so intricate in it's detail. I didn't even realize until I was cleaning it up how detailed it is. At first glance it just looks like, ah yeah, fruits and flowers. But when I started really looking closely I saw cherries and pears and strawberries and apples. Then I see dogwoods and thistles and daffodils and morning glories and lenten roses and daisies. And then, up in one corner, a butterfly. Just one. I loved the hammered aluminum pieces. This one is a beauty! I have several but none as nice as this. Wow, I find a lot of them terribly abused or should I say well used! I have a round tray is use almost daily. Love this one the detail is astounding. Now what GW is this your talking about?? smile! Great find!! The best part is that you can spill on it and it won’t be ruined. Lucky, Suzy…you do have a good thrift store. I have the exact same tray. And what’s really weird is that just TODAY I found a new place for it in my dining room re-do. What a gorgeous tray! I love going to the thrift shops too, but haven’t found any really good finds lately. I forgot to mention in my OWOH comment that I used to live in Hampton myself when I was a kid. Now I’m in Upstate NY. I love these aluminum trays. 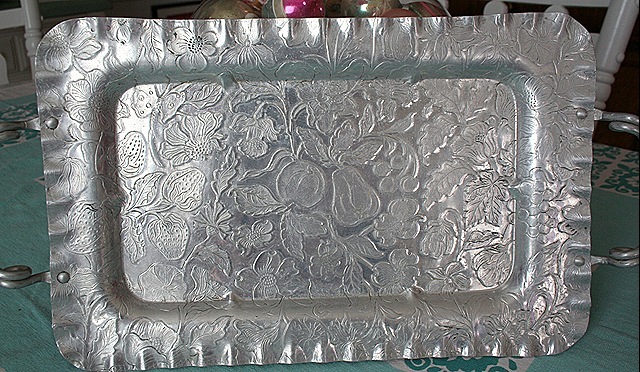 This is a great example of the serving trays that were so popular when I was growing up. The best thing is that they are usually very reasonable. Cool that you noticed the butterfly! 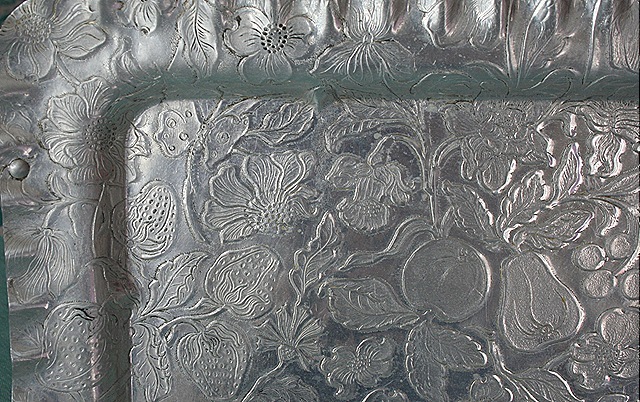 I like hammered aluminum–thought I might start collecting it after reading a feature in Martha Stewart Living some years back–but the few pieces I now have (thrifted for cheap) don’t exactly make a collection. I really should pull them out more often.